When Andie Miller goes to see her ex-husband, North Archer, to return ten years of uncashed alimony checks, he asks for one final favor: A distant cousin has died and left him guardian of two orphans who have driven out three nannies already; will she take the job? Bribed with money and a need for closure, Andie says yes, but when she meets the two children she realizes things are much worse than she feared. The children aren’t any run-of-the-mill delinquents, the creepy old house where they live is being run by the worst housekeeper since Mrs. Danvers, and something strange is happening at night. Plus, Andie’s fiance thinks it’s a plan by North to get Andie back, and since Andie’s been dreaming about North since she arrived at the house, she’s not sure he isn’t right. Then her ex-brother-in-law arrives with a duplicitous journalist and a self-doubting parapsychologist, closely followed by an annoyed medium, Andie’s tarot card–reading mother, her avenging ex-mother-in-law, and her jealous fiancé. Just when Andie’s sure things couldn’t get more complicated, North arrives to make her wonder if maybe this time things could be different…. 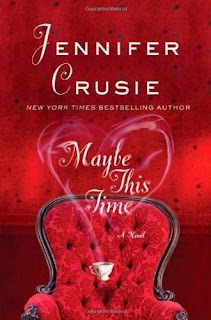 Source: Info in the About Maybe This Time was taken from the author's website at http://www.jennycrusie.com/books/fiction/maybe-this-time/ on 31/08/2010. Cool choice! Have you tried her work before? I want to read this one too!